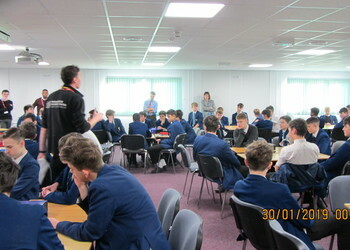 Sponsored by local company Jocob’s Engineering, STEM NOW, based in Winchester, visited Year 10s recently to set them a challenge. Their brief: Design and build a model footbridge, which would be able to cross over the M4 motorway; with minimum financial losses, and minimal disruption to the local environment. This is exactly the kind of work Jacobs Engineering gets involved with. Separated into teams the Year 10s had to assign roles; from Project Management, Design Engineers, Finance Managers and Communications Engineer. At the end of their design and build session the Year 10s had to ‘pitch’ their idea and show their design to the rest of the group. The STEM professionals were impressed with the range of different designs the boys came up with and their reasons for choosing to build on a particular location, e.g. town or village. Due to the determination and excellent work throughout the day the judges were unable to decide on the winner. They left Forest and after overnight deliberation contacted Mrs Lewington to announce the two winning teams. We will now go forward into the final stage of the competition against winning teams from 7 other schools. We are delighted to confirm the final will be held here at The Forest School, 27th March. We’ll bring you more information about that soon.